Cute Kids Styles in Hypoallergenic Childrens Earrings! Hypoallergenic Childrens Earrings in Gold and Surgical Steel – Our surgical steel hypoallergenic earrings for kids are perfect because the earrings are smaller in size. 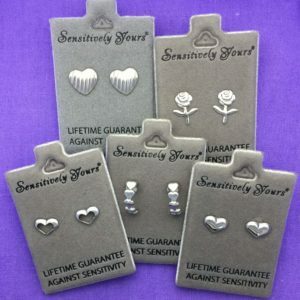 We have many choices to choose from, including gold and silver surgical steel hypoallergenic earrings for kids. Click on a style of hypoallergenic children’s earrings for a detailed description and a larger image. Even though we call them “Childrens Earrings”, we’ve also spotting some customers of all ages wearing them! Feel free to zoom in on our photographs and view the assortment for the styles you are looking for. For size, please take a close look at the photographs on an actual model’s ear, if provided. They will also show in both metric (mm) and standard (inches). If you are not seeing what you are hoping to find here, please take a look at the links at the bottom of the Product Description to see additional styles and/or sizes. Thank you for visiting us for your sensitive skin jewelry shopping.